Love is all you need, love wins, love you...all of these feelings are encompassed with this Heart Hands Lapel Pin. Make it a staple to your wardrobe; wear on your lapel, hat or lanyard every day. Makes a symbolic and trendy gift to give to your favorite group, or hand out at a special fundraising event. It is die struck from jeweler's metal, hand filled with enamel colors, and black die plated. Each includes a standard clutch back to keep this securely in place and comes individually poly bagged. 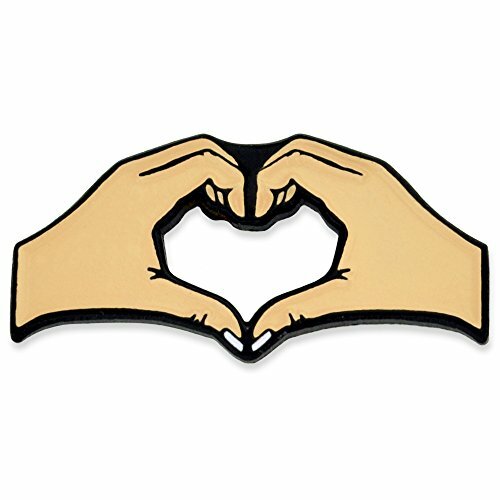 Love is all you need, love wins, love you...all of these feelings are encompassed with this Heart Hands Lapel Pin. Make it a staple to your wardrobe; wear on your lapel, hat or lanyard every day. It is die struck from jeweler's metal, hand filled with enamel colors, and black die plated.